Dental infections commonly arise from a tooth problem but can also be related to the surrounding periodontium which are supporting structures of the teeth. Keeping the periodontal structures aside, there are many reasons as to how a tooth can cause dental infections. Dental infections should not be underestimated as it can affect the rest of the head and also the neck region, leading to complications, which if left untreated, is potentially life threatening. There has been many cases demonstrated worldwide where dental infections that were not managed properly has lead to death, hence they should be taken seriously. Dental infections are very easily manageable when they are well localised and it is only until when they are allowed to spread through to other structures that a serious problem can arise. It is of utmost importance at any sign or symptom of dental infection, it is checked out by a competent dentist. And in the case of root canal related dental infections, the offending tooth is identified. 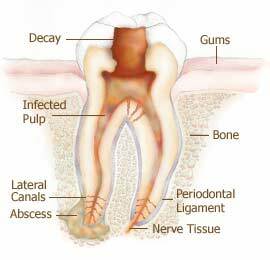 What are the causes of root canal infection? Root canals are structure that runs within a tooth. It carries the blood and nerve supply, which are collectively referred to as the pulp. The pulp commonly extends from the very centre of the crown, where it is known as the pulp chamber, all the way down to the roots. Different layers of mineralized tissue, including dentin and enamel or cementum, surround the root canal system. Such mineralized layers provide protection to the root canal system or the pulp. This protective barrier limits the passage of external debris and most importantly bacteria to the pulp. There are several ways where this barrier could be breached such as in the instance of dental decay, lost of dental filling, dental trauma, bruxism or teeth grinding, and possibly but more rarely, gum recession exposing root surfaces. Root canal infection can also be secondary to a spreading infection from periodontitis. All these lead to exposure of dentin which eventually form direct communication to the root canal. Why is exposure of dentin crucial to pathology of root canal? Dentin comprises of many tiny porous channels that run to the pulp or root canal of the tooth, but passage is usually limited by overlying enamel. 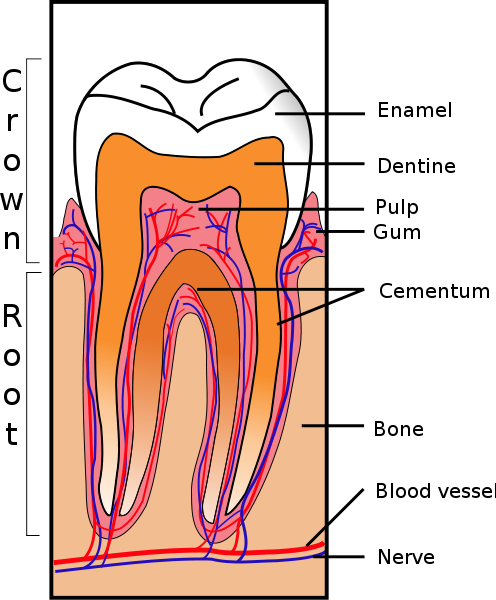 These channels render the total breakdown of dentin till the extent of exposing the root canal directly to the mouth redundant in causing dental infections because the breach of the dentinal layer in adequate depth alone is often enough to allow sufficient adverse communication between the external and internal surface of the tooth. Such communication allows passage of substance such as saliva, food debris and bacteria from the oral cavity into the tooth. Bacteria will start to colonise the inside of the tooth similar to the dental decay process. With dissolved sugar in saliva as its food source, bacteria will continue to penetrate the tooth through the dentin channels to reach the pulp chamber. How does root canal infection spread to other areas? When in close proximity to the root canal system, bacterial ingression will affect and eventually reach the pulp itself, causing problems such as pain and sensitivity. As the pulp contains blood vessels, it provides another great source of food for bacterial growth. The structure of the pulp being restricted inside the tooth also limits its repair and infection draining capacity, acting as a protective shelter for bacteria from external agents such as mouth rinses and toothpaste. This leads to further proliferation of bacteria and will eventually infiltrate the entire root canal system. Such infection of the root canal system can track to the end of the root, escaping to the surrounding bone structure causing loss of bone. This can sometimes collect around soft tissue, causing more damage as the infection tries to drain itself, forming a soft tissue communication known as a fistula. As the infection tries to escape the soft tissues, it usually presents as a gumboil which can burst and may persist as a small soft tissue opening if the cause is not removed. The opening can extrude pus from time to time. Dental infections that originate from a root canal if left unmanaged can also cause spreading of infection to surrounding tissues in the head and neck region. 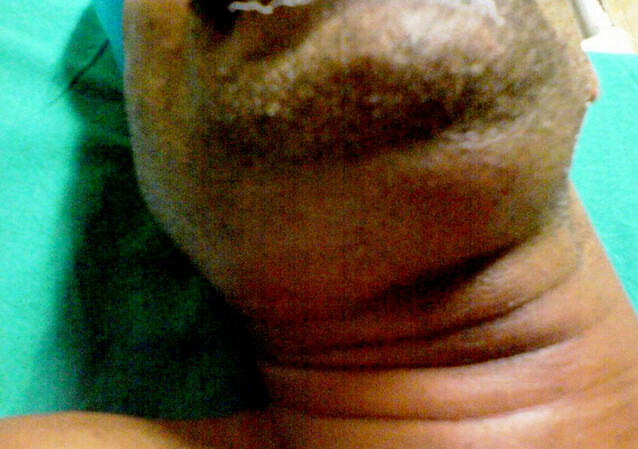 Due to the anatomical separations between potential tissue spaces, muscles, bone and connective tissue, dental infection particularly on the lower jaw tend to track downwards towards the neck. Such conditions are not uncommon and large swellings can be present, for example in Ludwig’s angina. Dental infections that spread to the neck can lead to life threatening situations as it may compromise the airways and throat, causing difficulty breathing and swallowing.